The communications tab appears in most modules and master records. It allows a user to enter notes that can then be assigned to either the current user or another user for followup on the specified date. While it is not a Customer Relationship Management system it can assist your team in keeping informed on your customers activities and communications. Click the Communication icon on the main menu. Filters – Set a filter to display only the communication that the user wants to see. The most common one is the “Assigned To” filter so they only see their own communications. 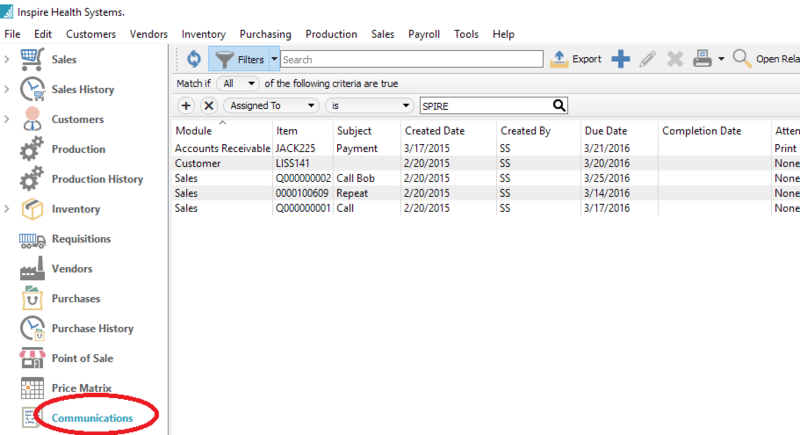 Export – Exports the list of communications to Excel or .csv based on column and position selection. Add – Adds a communication. Edit – Edits a communication. Delete – Deletes a communication. Print – Any report that has‘Communications’ as a Crystal Reports template will be presented. Open Related – Opens the module and record for the source of the message. Module – The module where the communication was created. Item – The record for where the communication was created. For example the customer number, sales order number or inventory item. Subject – The subject the user put on the communication. Created Date – The date it was created. Created By – The initials of the user that created the communication. Due Date – The date the assigned communication is due for completion. Completion Date – The date entered when it was completed. 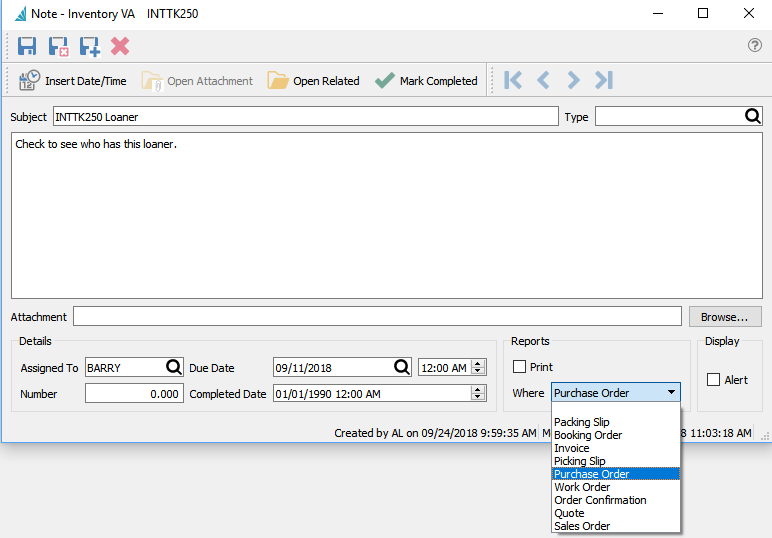 Alert – Means that this message will pop up when editing a document like a sales or purchase order when the item, customer or vendor is added. Print – Means this will be printed on whichever form was selected. *Note- The Crystal Sub Report that contains the communication on forms is hidden by default. Speak with your Spire partner to assist with revealing it. Display Type – The form that this communication should print on. For example on Invoices or Purchase Orders. Assigned To – The user’s initials that the communication is assigned to. Modified Date – Date this communication was last edited. Modified By – The users initials that last edited this communication. *Note that there is no security that stops users from seeing each others communications. However the user can be blocked from seeing notes from certain modules.